Charming bracelet adds color and style to any outfit! 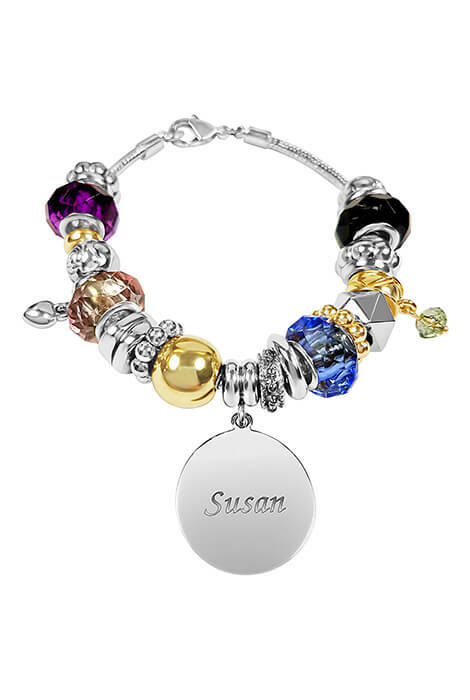 Two-tone design with goldplated and silverplated beads and charms, along with bold, colorful plastic gems, is the perfect accompaniment to the personalized silvertone charm. Makes a great gift! Specify name: 1 line, up to 9 letters/spaces, upper/lower case. Zinc/resin bracelet is 8" long with 7/8" dia. charm. Allow 4–6 weeks for delivery.